ALL STAFF: This site is no longer available outside the Bedford showroom and from 1st March 2016 this system will be taken down entirely. 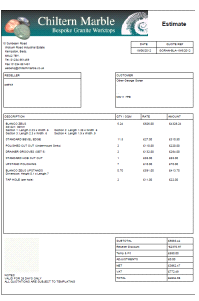 Please ensure all quotes are retrived before then and no new quotes are created. * If you already have a login you do not need to register again. We have introduced a new range of Contract Quartz and Granite. We will be holding large stocks of these materials so wastage will be minimized from job to job. These materials are priced very competitively and available in 30mm only. You will be able to use the online reseller quoting system (Reseller V2) to obtain an instant quote. We have introduced a new ‘Trade Only’ price list. 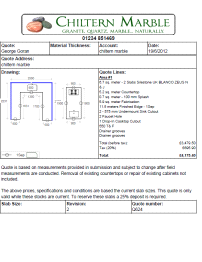 We believe these are the best prices for fabrication costs on the market. (e.g. undermount polished cut out £75.00). These will be automatically applied to the new reseller system. We have invested in a new quoting system that will take into account the slab sizes currently available and off cuts we hold in stock. This can mean significant savings to you. You will be able to upload your plan and we shall endeavor to return within 2 hours with a fully adjusted ‘bottom line’ quote taking into account material available now. An example of the savings between the new and old system is laid out below.